Eye to Eye Parenting and its programs are based on the internationally recognized Positive Discipline program. This multi-week series helps parents raise responsible, respectful and resourceful members of their communities. Based on the best-selling Positive Discipline books by Dr. Jane Nelsen, Lynn Lott, Cheryl Erwin, and others, it teaches important social and life skills in a manner that is deeply respectful and encouraging for both children and adults. Through interactive exercises and giving hands-on tools to use immediately, this series is a great next step in your parenting journey. Pre-registration is required. You can register for this series through Eye to Eye Parenting Website or emailing hello@eyetoeyeparenting.com. Do you have a picky eater? We’ll discuss how to introduce solids, drop the bottle, how to deal with food refusal, and how to get your child to eat more than just chicken nuggets and french fries. Toddlers, teens, and all ages in between. We’ll talk about tantrums, aggression, whining, talking back, and how to increase your child’s cooperation. Pre-registration is required. 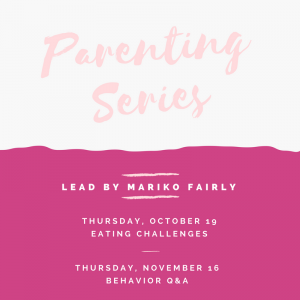 You can register for the Parenting Series by calling the store at (818) 380-3111 or through the online registration page. Please join Jaquelin Levin-Zabare as we explore using essential oils to support a healthy pregnancy and birth as well as newborn care and family wellness with essential oils. We’ll also discuss some postpartum issues and how essential oils can enhance your and baby’s transition from birth to postpartum. Learn ways to naturally support your body throughout normal pregnancy changes and throughout labor and birth. Please call (818) 380-3111 or email info@shopthehaven.com to be added to the interest list. Pre-registration required. You can register for the Essential Oils Seminar by calling the store at (818) 380-3111 or through the online registration page. Connect with other Pregnant Families at our Pregnancy Social! Join us at A Mother’s Haven for refreshments and lite bites at our Pregnancy Social! Mix and mingle with other expecting Moms and Dads, experts in the maternity and parenting field, our Mother’s Gathering Instructors and more! Babywearing 101 is designed for expectant and new parents who are interested in learning the basics of babywearing. Studies and Mama’s instinct tell us babies are meant to be held and babywearing makes it convenient and can free up Mom or Dads hands when needed! There will be a time, in the end, to try on carriers. Feel free to bring your baby with you. We will have weighted dolls to use in trying on the carriers. This class is ideal for those with little or no experience babywearing. You will leave ready to choose and use your first baby carrier. With so many different makes, models and types of car seats coupled with so many different makes and models of vehicles, choosing a car seat for your child and understanding how to use it properly can be a “daunting” task for parents and caregivers. Just reading the manual can often seem like trying to read a foreign language. This class will provide education on the “Safest Car Seats” for your baby/growing child, information on used car seats, how to properly use your car seat, and why you should not use aftermarket products. We will also provide education about airbag safety, loose cargo inside the car, the safest areas in the vehicle, the controversy between the LATCH system and the vehicle belt, the California Child Passenger Laws, common safety hazards, the American Academy of Pediatrics (AAP) recommendations, traveling with your child (including air travel) and how to travel in the car with pets. *We will also demonstrate how a pregnant mommy can better protect her baby and herself when driving/riding in a car. For more information about our other ongoing classes, check out our class calendar or call the store at (818) 380-3111.